Who needs regular old biscuits when you could have these fluffy and flavorful French Onion Sour Cream Biscuits?! They are great spin on a southern classic! 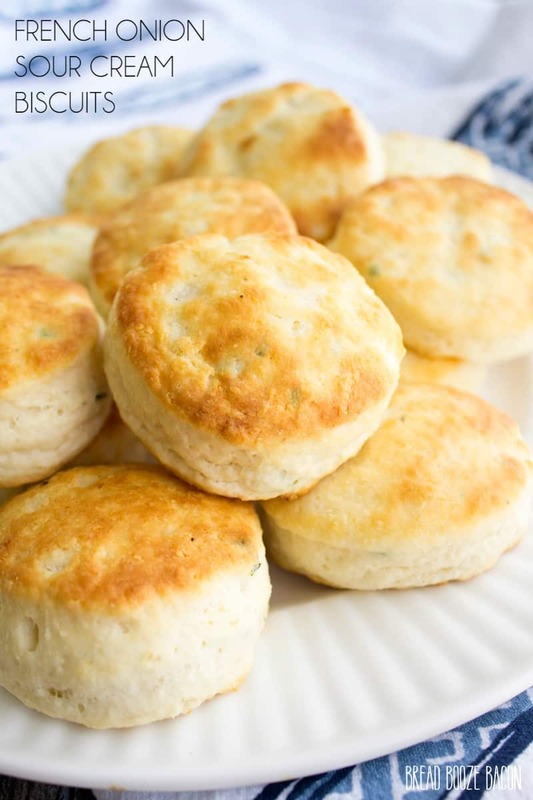 Is there anything better than a hot biscuit? While I tell myself chocolate might be, when there’s a biscuit in my hand there’s nothing else I want. And these biscuits are next level good. 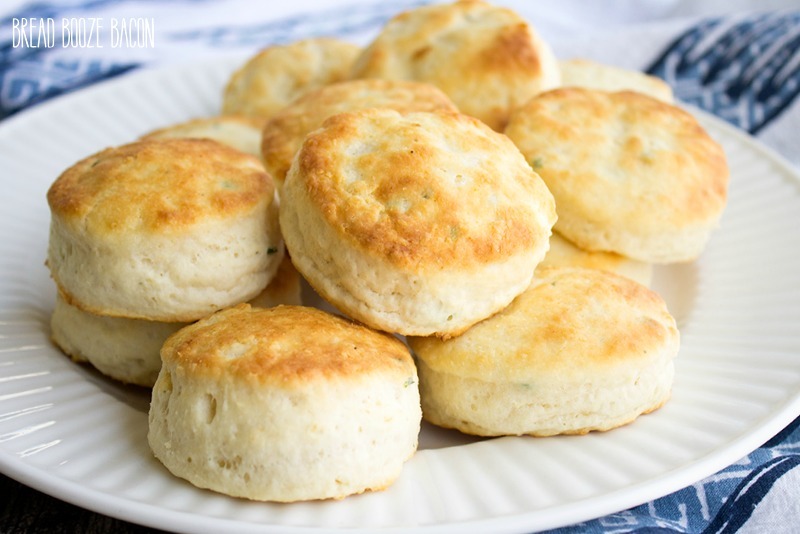 They are buttery, flaky, and have a savory onion flavor that is crazy good! While I first thought about serving them alongside dinner, there are so many possibilities – from your new favorite eggs benedict to leaving them on the counter for a day or two and using them for a savory bread pudding. My mind is spinning with ideas. Like next time, I think I might add some roasted garlic. Mmmmm…garlic and French onion. Just look at the gorgeous crumb on these little guys! Don’t you just want to eat everything!? You should see the spread they had on the table for her QVC spot. It was everything I’ve loved since I was a little girl. 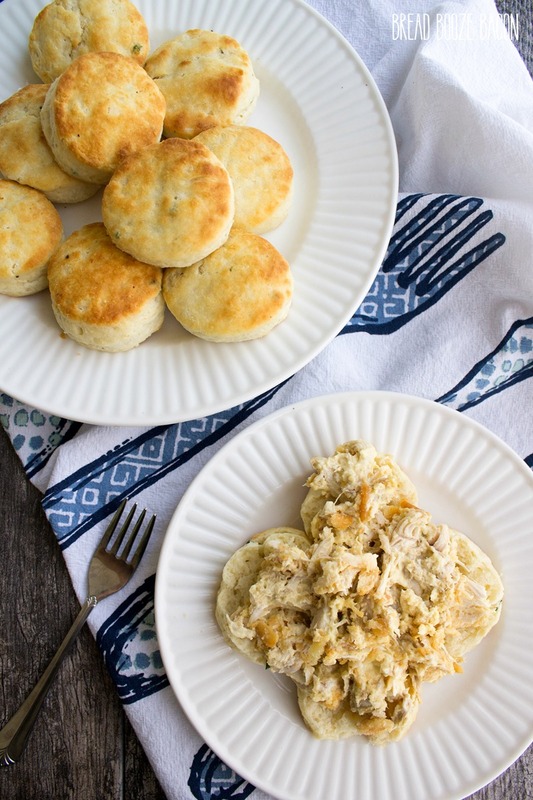 Because I can never leave well enough alone, I used these biscuits to dress up one of our new favorite dinners, Creamy Chicken Ritz Casserole. 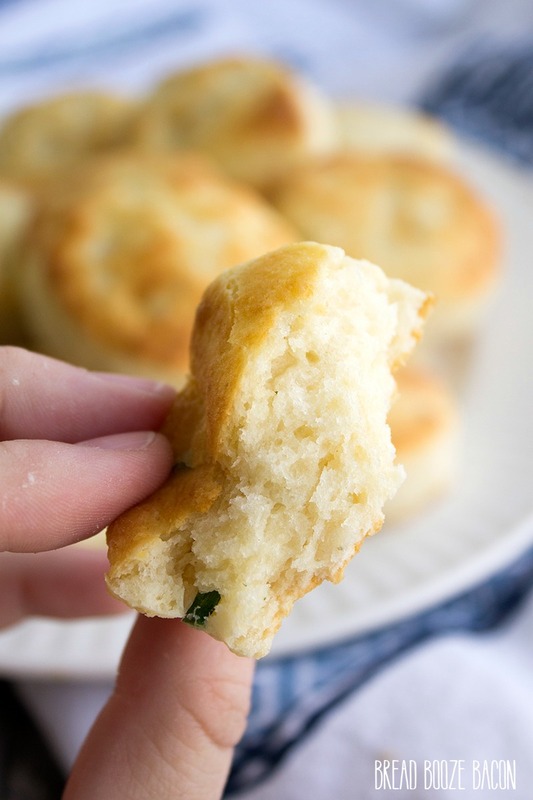 I spooned the hot chicken over these fluffy biscuits and it was magical! You need to make these biscuits ASAP kids!! Love free stuff? 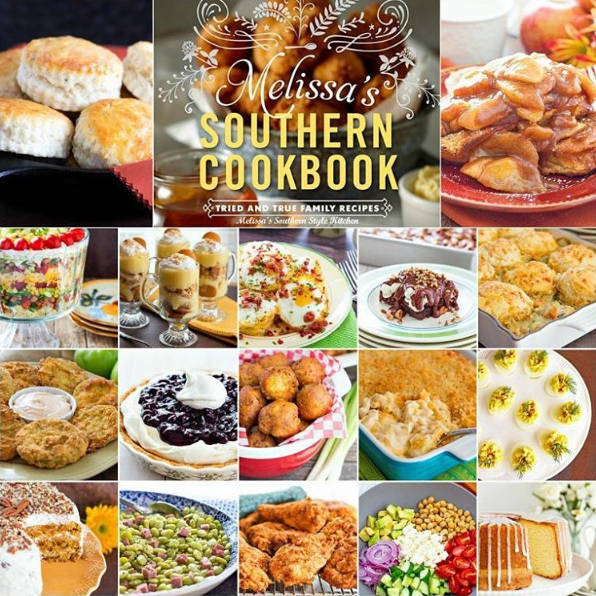 I’m giving away 1 copy of Melissa’s Southern Cookbook: Tried and True Family Recipes to one lucky reader. To enter, participate in any of the options in the form below that you’d like. A winner will be chosen on June 7th. This contest is open to US residents only. You must be 18 years or older to enter. The winner will have 48 hours to confirm prize receipt or a new winner will be chosen. Preheat your oven to 450 degrees F and line a baking sheet with parchment paper or a Sil-Pat. Set aside. In a large mixing bowl, stir together the flour, chives, and garlic powder until combined. Make a well in the center of the dry ingredients and add the French Onion dip and 1/4 cup of heavy cream to the well. Turn the dough out onto a floured non-stick surface and knead it gently 6 times, coating lightly with flour on all sides. Roll the dough to 1/2-inch thickness. Use a 2 1/2-inch (or 2-inch) round biscuit or cookie cutter to cut the dough into rounds. 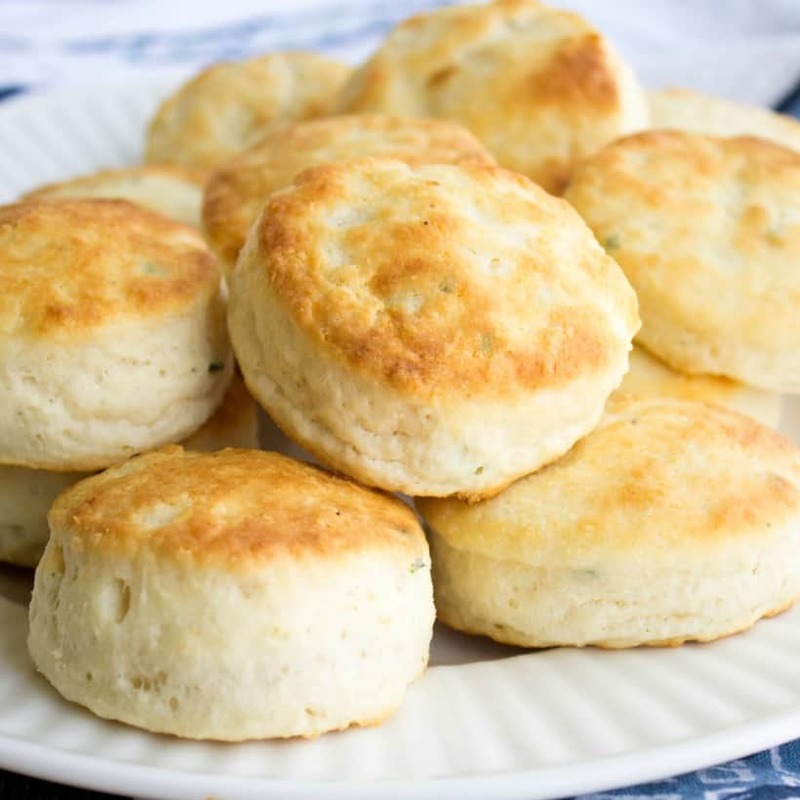 Re-roll the dough as needed and continue cutting out biscuits. 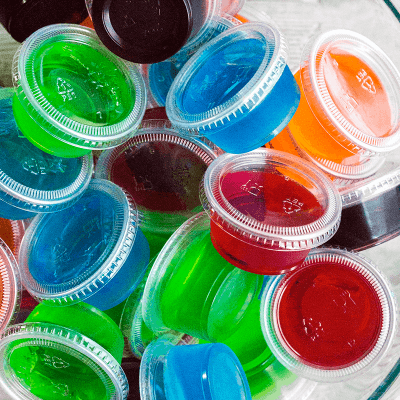 Place the rounds onto your prepared baking sheet and brush the tops with about half the melted butter. If you don't have self-rising flour on hand you can substitute 1 3/4 cups + 2 tablespoons all-purpose flour mixed with 1 1/2 teaspoons baking powder and 1/2 teaspoon salt. 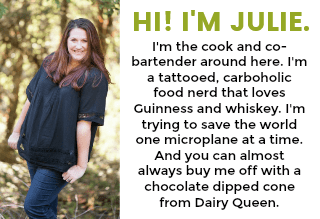 Beautiful post Julie, thanks so much! My favorite side dish is anything with sweet potatoes. Growing up I never liked them, now they are on the table in some form at least twice a week! Potatoes and gravy! And bread! Warm bread with butter- LOTS of butter! Wait, is bread even considered a side dish? If not, it should be! What a great looking cookbook. My favorite side dish is French fries.